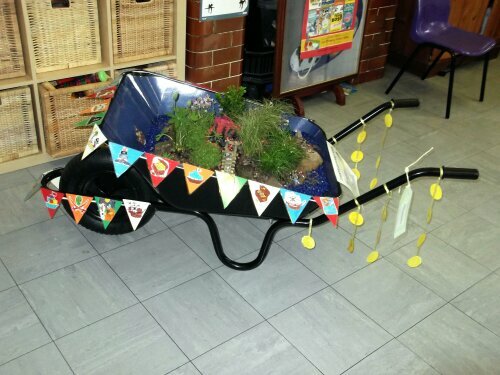 Each year at the RHS Cardiff Show in Bute Park, a competition is held for schools to enter a planted wheelbarrow under a chosen theme. Gardening vouchers are awarded to 1st, 2nd and 3rd place. This year’s theme is children’s literature. “Treasure Island” was chosen as Tongwynlais Primary School’s entry and the children of Year 1 have worked very hard on it. The show is held this Friday, Saturday and Sunday (19th, 20th & 21st). Winners are decided by public vote at the show, so please vote for it!